Old Testament - Today we begin the book of Second Kings! Content: Second Kings covers a period of approximately 250 years during which time two national tragedies occurred. In 722 B.C. the northern kingdom of Israel was destroyed by the Assyrians, and in 586 B.C. the southern kingdom of Judah was destroyed by the Babylonians. The reigns of the various kings are described in some detail with care being taken to show the spiritual significance of what they were doing. Throughout this whole time of good and bad kings, war and peace, prosperity and ruin, God is seen to be at work, in particular sending prophets to preach his word and warn of judgment to come. 2 Kings 1 today... wow... Elijah is not to be messed with when he is sitting on top of that hill! Elijah asks a very poignant question twice in this chapter - "Is there no God in Israel?" This is a question each of us will need to ask in our lives at some point - "Is there or is there no God in my life?" Hopefully we've already answered this question affirmatively. It's a sad state of affairs to imagine a country without God. It is a sad state of affairs to imagine our own lives without God. Okay, so 2 Kings 2 verses 23 & 24 are some of the most unique verses in the Bible no doubt... "Elisha left Jericho and went up to Bethel. As he was walking along the road, a group of boys from the town began mocking and making fun of him. "Go away, you baldhead!" they chanted. "Go away, you baldhead!" 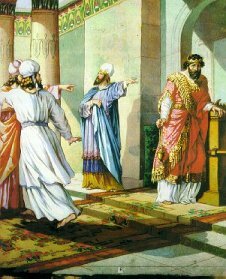 Elisha turned around and looked at them, and he cursed them in the name of the LORD. Then two bears came out of the woods and mauled forty-two of them." Zondervan's NIV Study Bible has some good commentary on these verses as follows: "The youths from Bethel no doubt assumed that Elisha was going up to Samaria to continue Elijah's struggle against royal apostasy. 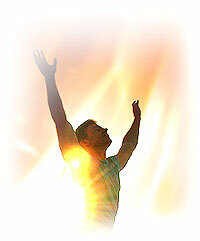 Some believe that the youths, in their mocking, were telling Elisha to ascend to heaven as Elijah had done. By calling Elisah "baldhead" the youths from Bethel expressed that city's utter disdain for the Lord's representative, who, they felt, had no power. Elisha pronounced a curse that gave warning of the judgment that would come on the entire nation of Israel should it persist in disobedience and apostasy." 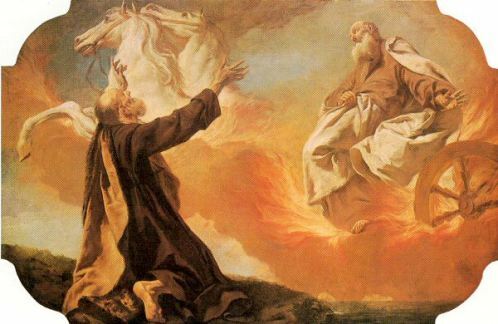 Bible.org's commentary on today's 2 King's readings titled "Chariots of Fire" is at this link and "Elisha's Accreditation" is at this link and "Elisha and the Two Bears" is at this link. New Testament - Great readings today about how Paul and Barnabas' ministry to the Gentiles was growing! Verse 52 is awesome: "And the believers were filled with joy and with the Holy Spirit." 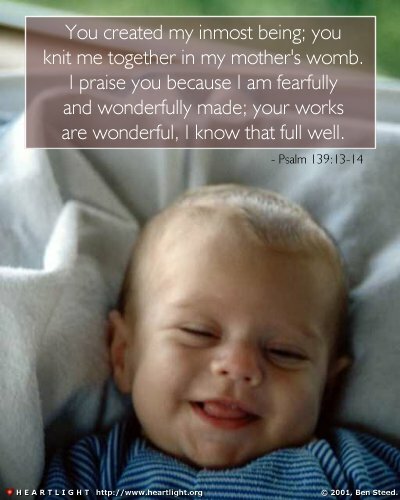 Psalms - Today we read Psalm 139! I LOVE this Psalm... and had somehow forgotten about it. Is this Psalm anyone's favorite Psalm out there? I would not doubt it if was. This is just an incredibly beautiful Psalm about how much God loves and cares for us. And just how well God knows us. Please read and re-read this Psalm this week if you can. And rejoice in how much God loves you and how much he knows you. Each of the verses in this Psalm are incredible. I'll highlight a few. 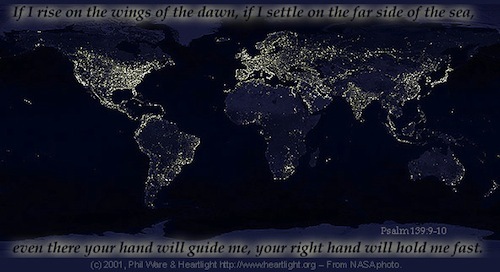 Verse 3 - "You chart the path ahead of me and tell me where to stop and rest. Every moment you know where I am." Do you believe that God charts out your path for you? Do you believe that God gives you true rest? Do you believe God knows where you are every single moment of your life? 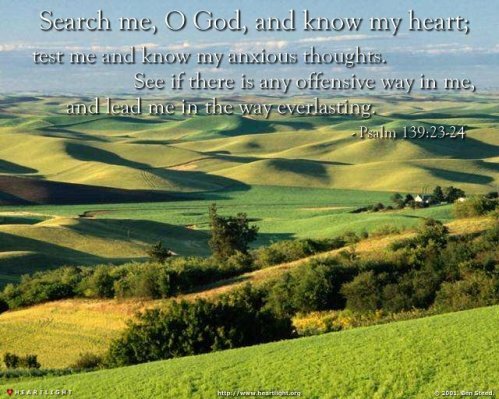 And verses 23 & 24 to close out the Psalm: "Search me, O God, and know my heart; test me and know my thoughts. Point out anything in me that offends you, and lead me along the path of everlasting life." Do you consistently ask God to search your heart and mind? Do you confess to God what is not right in your heart and mind? What needs healing? Do you ask God to even point out to you things that you may not realize are destructive to you and others in your heart and mind? Do you believe that this process of confessing your sins to God and asking for forgiveness and healing will lead you along the path of everlasting life? Proverbs - Proverbs 17 verse 20 stood out to me today - "The crooked heart will not prosper." Do you believe this is true? What would make a heart crooked? Whom can heal a crooked heart? Jesus? 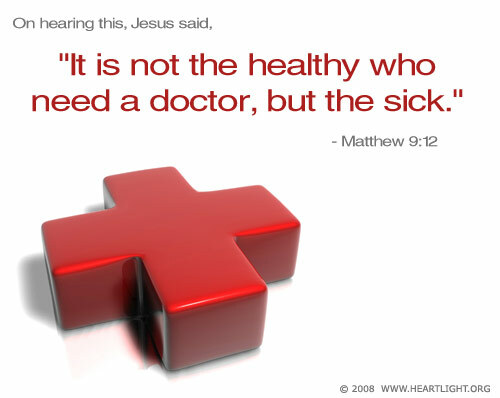 Has Jesus healed your heart yet? Will you let Him do so? YouTube: Today's readings in Psalm 139 reminds me of the beautiful song by Josh Wilson called "Before the Morning." Check out this video with a powerful story behind this song... This is well worth taking 10 minutes to watch and praise God as you hear this story of amazing grace. Are you awaiting the Morning dawn in your spiritual life? Click here for a new day! Prayer Point: Praise God for making you in your mother's womb. Praise God for His wonderful works. Pray that your inmost being is living fully for God today and forevermore. As I read through these two chapters I realized that the number fifty is all over the chapters. 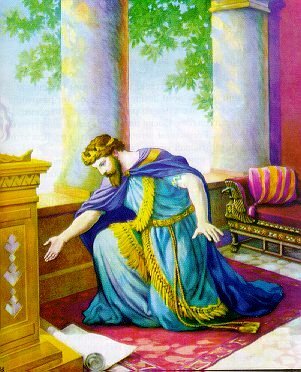 There are three sets of fifty men who are sent by King Ahaziah to take custody of Elijah. 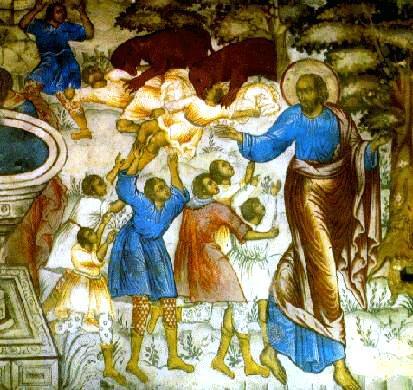 In the second chapter, a group of fifty men watches (7) as Elijah and Elisha are beside the Jordon River. 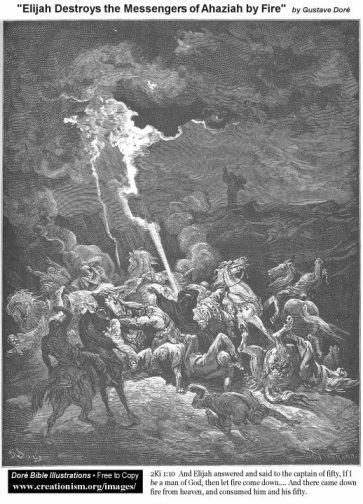 Moreover, after the chariot takes up Elijah the prophets offer to form a search party to find Elijah consisting of fifty of their strongest men. 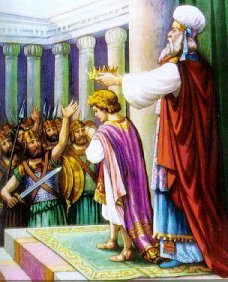 I remember that David’s two sons, Ablsalom and Adonijah used fifty men to run before them in their attempt to usurp their father’s throne. I’m not sure if that number is just a number or if there is some significance. What struck me about the two sets of fifty men who were burnt up at the word of Elijah were their cavalier attitude toward the prophet as they came to arrest him. They called him a “Man of God,” yet their attitude toward him seem to be disrespectful. Could their approach be a form of “Taking the Lord’s name if vain?” Was the tone of their request filled with sarcasm and mockery instead of reverence for the Name of God? Attitude is everything. Attitude determines approach and approach determines success or failure. Do I come to God using His name in vain? Do I come to God with an attitude of sarcasm and mockery instead of reverence and godly fear? Sarcasm and mockery are rooted in unbelief so do I really believe that God will do what He has said He will do? 13 45 But when the Jewish leaders saw the crowds, they were jealous. Why are we moved to jealousy? If the love of money is the root of all evil then jealously must fuel the desire to gain the money that is so sought after. The leaders wanted the crowds for themselves, to fulfill their need for recognition and power. I’m trying to think back to the time when I couldn’t stand Christians. I told myself now that I detested Christians because of the abuse I experienced at the hands of supposed Believers. Now I’m wondering if the real cause, the true cause was jealously disguised under a cloak of pain and fear? I know not all believers are wolves dressed up as sheep so why did a chose to focus on the wolves instead of the sheep. I must do some deep soul searching. 5 You both precede and follow me. God is encamped around about me no matter where I take myself outside of his direction. In the 23rd Psalm, The Lord is the Psalmist’s Shepherd who leads him, guides him, finds food for him. However, in the forth verse, the Psalmist’s dependency on God for everything is broken by the “I” word, “Though I walk …” It appears that God is no longer directing at this point, yet he fears no evil because His rod, His staff comforts David. So the sweet Psalmist of Israel had first hand knowledge of God encasing him with his presence. 21 It is painful to be the parent of a fool; there is no joy for the father of a rebel. Often times the words of Solomon cuts to the quick and one doesn’t have to think on or contemplate the meaning of his wise words, one knows deep in the heart experientially that the words are true. I can confirm the truth of the above verse. What an amazing story told by Josh Wilson of his friends faith and of the tiny evagelist who was given only a 2% chance of living at birth. As the father told the story, he often paused to gain control of his emotions. I thought, "Go ahead and weep, my friend, because I'm weeping with you." What a story of faith! So often the gospel is played out in the lives of believers and no better example can be given than today's story related through the friendship and music of Josh Wilson. Thank you, Mike, for always bringing good music to us along with our Bible lessons.